The title gives a clear indication of what this Stanley Donen musical will be about, but it does not tell us how we will arrive at that conclusion. It all begins when a woodsman named Adam (Howard Keel) comes to town intent on finding himself a cute and handy bride. That he does in Milly (Jane Powell) and soon enough, in a whirlwind, they are married and heading back to his home. There she is greatly surprised to meet his rambunctious and rough-edged younger brothers. Six to be exact, but you already guessed that. Once she accepts her new life, it becomes Milly’s mission to straighten them out and find them girls to court. It isn’t easy but soon they learn table manners and proper etiquette before the big barn raising takes place. There the boys make quite the impression and the audience is given quite the show complete with bright colors and inventive-foot-tapping choreography. It’s an understatement to say that the Pontipee brothers are not popular with the locals, and not only is there a barn-raising but some hell-raising as well. Adam is proud of their showing, but the rest of the lads are lovesick as the long cold winter begins, separating them indefinitely from their girls. With Adam’s encouragement, they decide to do as the Romans and kidnap their sweets, but they fail to think about the consequences. The town’s in an uproar, the girls are frightened, and a man-made avalanche means there is no contact with the outside world for at least 5 months! Milly is appalled by their actions, especially Adam’s part, and the lads are made to sleep in the barn as she dotes over the scared group of girls. Not liking what he’s seeing, Adam heads off on his own for a while. Spring brings a fresh start as young love flourishes and the boys are forgiven. Milly gives birth to a baby girl, and Adam finally returns home with a new perspective. But what about the town folk you ask? They do come after the Pontipees, and they don’t like what they see when they ride in. Needless to say, it is a happy ending with each boy getting his girl, thanks to a few shotguns. With catchy songs, beautiful color cinematography, lively dance numbers, and an amusing premise, this is a very strong MGM musical, even if it is not the best of the lot. That is not saying much because the studio could hardly go wrong with such previous titles as On the Town, An American in Paris, Singin’ in the Rain and The Band Wagon. 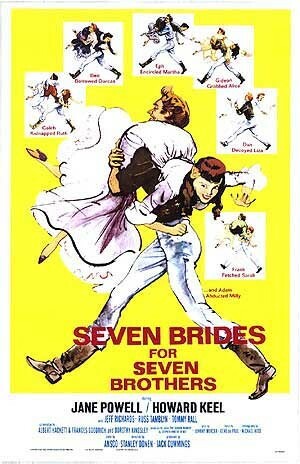 Seven Brides is a nice addition although I will say it vaguely reminded me of Oklahoma. However, it is different enough to be well worth it. The only question left to ask is, “Are Adam, Benjamin, Caleb, Daniel, “Frank,” and Gideon natural red-heads? I’m not sure I know the answer but I could wager a guess. This entry was posted in 1950s, Musical, Romance and tagged Howard Keel, Jane Powell, Michael Kidd, Review, Russ Tamblyn, Stanley Donen by 4StarFilmFan. Bookmark the permalink.